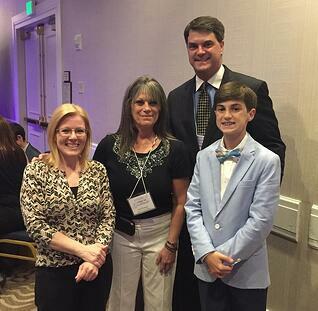 (Right to Left) Kristine Baker and Lisa Riviezzo of March of Dimes with Brion Zaeh and his son, Marshall Zaeh, at the March of Dimes' Night of Gratitude event. The March of Dimes recognized PBD Worldwide for their partnership during their annual Night of Gratitude event on Wednesday, May 31, 2017. The March of Dimes Night of Gratitude is an evening to celebrate and show appreciation for partners who are making a difference in the lives of premature babies (born and unborn) and their families across the country and around the world. This is PBD's 14th year being honored at the event as a Platinum Partner for the work they do for March of Dimes as well as their financial contributions to the organization. PBD Worldwide has a long and proud partnership with the March of Dimes that began in 2003. As March of Dimes order fulfillment partner, PBD provides fulfillment and distribution services, call center support and accounting services for their organization. “PBD is proud of our long partnership with the March of Dimes,” said Brion Zaeh, Senior Vice President of Client Relations. “We are honored to align ourselves with a great organization and help support their mission to end the #1 killer of babies in the United States, premature birth. PBD takes great pride in knowing our partnership with March of Dimes is making a difference in the lives of families affected by this crisis every day. This year's event was especially meaningful to my family and I because my son, Marshall, who was born premature, had the privilege of attending this year's Night of Gratitude with me." The March of Dimes works to end premature birth and other problems that threaten our babies. They help moms have full-term pregnancies and healthy babies. If something goes wrong, March of Dimes offers information and comfort to families. They research the reasons why babies are born too soon or very sick and work on preventions. To learn more, please visit www.marchofdimes.org.